This one-volume summary of American history cites all important names and dates. It covers European colonisation, the American Revolution, establishment of the Constitution, social and economic expansion in the nineteenth century, slavery and the Civil War, foreign policy between 1877 and 1914, World War I, the Depression era, World War II, the Cold War, the civil rights movement, Vietnam and social protest, social changes in the late twentieth century, the 9/11 crisis, wars in Afghanistan and Iraq, and the Obama presidential election. Question and answer sections of this title follow every chapter. Charts, graphs, diagrams, instructive line illustrations, and where appropriate, amusing cartoons help to make learning E-Z. 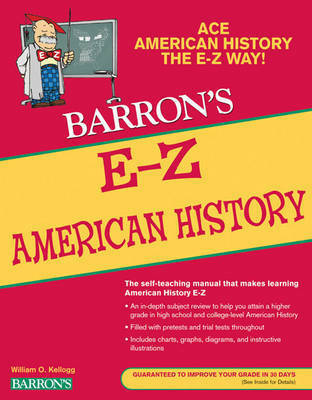 Barron's E-Z books are self-teaching manuals focused to improve students' grades across a wide array of academic and practical subjects. For most subjects, the skill level ranges between senior high school and college standards. E-Z books review their subjects in detail, using both short quizzes and longer tests to help students gauge their learning progress. All exercises and tests come with answers. Subject heads and key phrases are set in a second colour as an easy reference aid.